Despite being Sweden’s third-largest city, behind Stockholm and Gothenburg, Malmö has remained a well-kept seaside secret among Swedes, beloved for its chocolate-box cottages and family-friendly atmosphere. 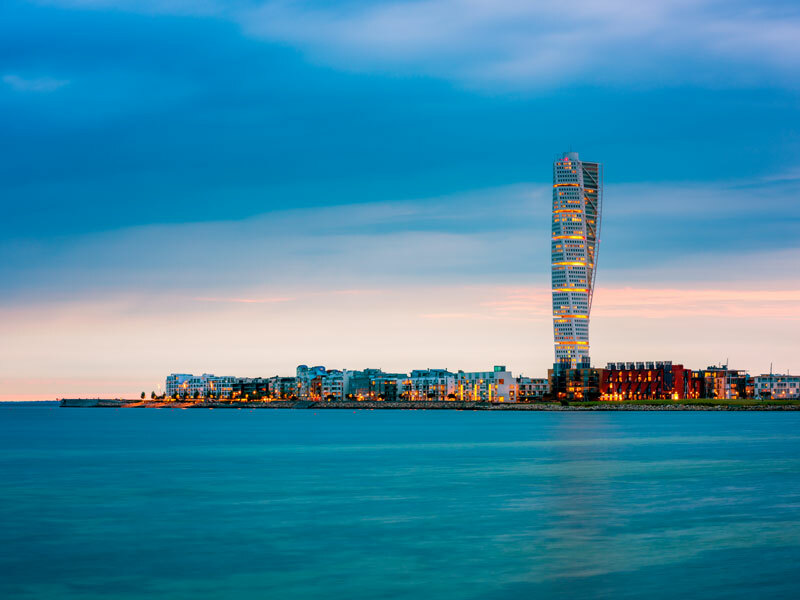 Located on the country’s southern coast, what Malmö lacks in Gothenburg’s dramatism or Stockholm’s style it makes up for with serenity and natural beauty. It’s in the summer, though, that the city really comes alive: Sweden’s chilly winter weather fades away and is replaced by brilliant sunshine and temperatures of up to 30 degrees Celsius. Malmö was chartered in the 13th century and, for much of its history, was known for its flourishing herring-fishing industry. During the Industrial Revolution, it housed one of the largest shipyards in the world, but when the shipbuilding industry began to decline in the 1980s, Malmö reinvented itself as an eco-city with a thriving biotech sector. Since the turn of the century, it has built a reputation as a centre of culture and knowledge, balancing its traditional roots with innovative new architectural and educational developments. On the western side of town, the former industrial Västra Hamnen area has been reimagined as a tech start-up hub, filled with ultra-modern, glass-fronted developments and the world’s first twisted skyscraper, the Turning Torso. Malmö’s small business sector has brought an influx of young people to the city, with almost half of the registered population aged under 35. This lends it a buzzing, ever-changing vibe. Västra Hamnen is bordered by Malmö’s string of beaches in the Ribersborg area, which are particularly popular with young families thanks to the shallow, calm waters. You’ll also find the city’s 200-year-old wooden bathhouse there, which is complete with an open-air saltwater pool and a traditional wood-fired sauna. At the westernmost point of the city is the Øresund Bridge, a five-mile-long feat of engineering that connects Malmö with the Danish capital, Copenhagen. Not only is it technologically impressive – the bridge carries a cable that facilitates internet data transmission between Sweden and Central Europe – but it’s also a testament to both countries’ commitment to maintaining a close political and economic partnership. In the city centre, charming cottages in pastel colours line Malmö’s cobbled streets, opening out to medieval market squares such as Lilla Torg. Choose one of the many cafes there to indulge in the Swedish art of fika, which roughly translates as a moment to slow down and take stock of life’s little pleasures, accompanied by a cup of coffee and piece of cake. For a more indulgent treat, book a table at one of Malmö’s 14 Michelin-starred restaurants: two-starred Vollmers boasts a menu filled with fresh, refined dishes that marry local produce with modern cooking techniques. The city is also packed with cultural attractions, from the design museum housed in a 17th-century grain store to the bright orange contemporary art gallery. Don’t miss Malmö Castle, which is nestled in the heart of Slottsmöllan, one of the city’s many ‘green lungs’. To experience Malmö at its vibrant best, visit during one of the city’s two famed summer festivals. Sommarscen is a three-month-long free arts festival, running from June to August, which includes music concerts and performance art across 44 different open-air venues. Malmöfestivalen, meanwhile, lasts for a week in August and features music and dance performances, food markets and interactive workshops, including one that offers the chance to duel with lightsabers. Getting to Malmö couldn’t be easier, with daily flights from many major European hubs. For a more dramatic entrance, fly to Copenhagen and take the train across the Øresund Bridge, relishing the sweeping views across the ocean.